Apple CEO Tim Cook says he is “outraged” by a series of New York Times reports alleging worker mistreatment and neglect at Chinese factories that assemble the company's iPhones, iPads, and other devices. The New York Times has painted an unflattering portrait of Apple's supply chain. 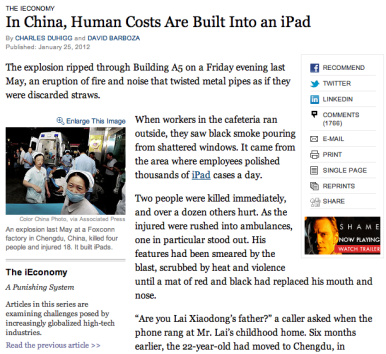 But it was Wednesday’s story—with a headline suggesting that “human costs are built into an iPad” that apparently aroused Cook’s ire. In its stories, the paper said Apple refused to comment on the allegations despite being provided “extensive summaries” of the Times’ reporting. Allegations of human rights abuses at its China suppliers have dogged Apple in recent years. In response, the company has joined the Fair Labor Association and created its own annual Supplier Responsibility Progress Report to document such problems at 156 of its suppliers—covering 97 percent of its supply chain—and efforts to correct them. The latest report, released earlier this month, acknowledged that underage workers had been found in several factories, but also detailed efforts to prevent a repeat of the deadly explosions that killed four Chinese workers. The company says it has trained more than 1 million workers at its suppliers in Apple's code of corporate conduct. The Times series comes in what should otherwise be a good week for Apple. The company on Tuesday reported a profit of $13.06 billion on sales of $46.33 billion for the first fiscal quarter of 2012.